Changing Child Custody – What is best for the children? Recently, NPR ran a story about the push to change custody laws in many states. The new measures favor equally shared custody for most parents after divorce. Supporters argue that if the parents are deemed fit and there is no domestic violence or abuse issues, joint custody should be favored in divorce cases. There are studies that indicate that children do better when they regularly see both parents. Why not mandate joint custody? It is always true that when there is conflict between parents, there is a negative impact on the child(ren). Perhaps implementing state-mandated joint parenting plans for parents going through a divorce would reduce conflict in some divorce cases. As family law attorneys, we stand behind measures that focus on the best needs of the child. We consistently coach clients on how to keep their children’s needs first when going through a divorce. It is critical for each parent to be positive about the other parent, at least in front of the children, and encourage that child to have a relationship with the other parent. Obviously, there are exceptions in cases where abuse is involved. The application of this theory is a little more complicated and must be designed to focus on what is best for the child(ren) NOT the parents. What if the parents don’t live near each other? What if the parents just cannot get along? What if the children have chaotic after school schedules? There are so many scenarios that it would be hard for a sweeping mandate to address every situation. What do you think? 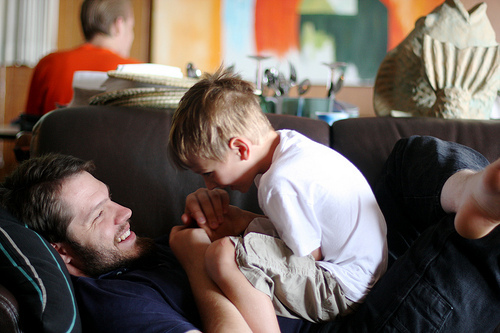 Would you support measures in Indiana that favor equal parenting time?